El Hierro is a small, unique island. The smallest of the Canary Islands, located in a remote corner of the world in the middle of the Atlantic, it has always been of interest to many European conquerors. This tiny volcanic island also features an interesting food and wine scenery, which recently has also been slightly changed with the arrival of immigrants working in resturaunts and coming from Venezuela, a country to which El Hierro has been in contact with for centuries, as many people from El Hierro moved to Venezuela until the 1960s. Now the opposite migration takes place. 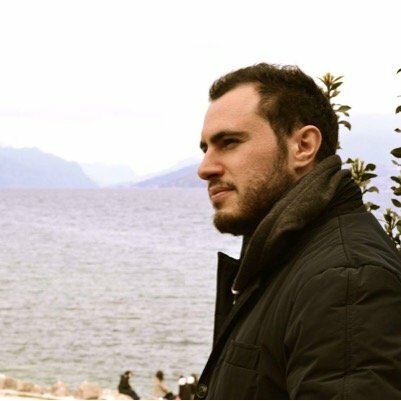 People are fleeing Venezuela due to political and economic instability, and finding peace and serenity in El Hierro, and other islands of the Canary Archipelago. Some plants from Venezuela are also found in El Hierro, like the Uva De Mar (sea's grape), which I found while hiking in the island. While driving through the islands, one can notice vineyards in the volcanic soil, goats and sheep (whose milk is used to make an excellent cheese in the area of San Andres) and extinct volcanoes, facing the Atlantic Ocean, which is also the provider of good seafood that is used for the local cuisine. In El Hierro wine has a strong tradition. It was an Englisman, John Hill, who planted the first vines here in the 16th century. The volcanic soil gives to the wine minerality, and also longevity. Some of the reds made are indeed ageworthy. Most of the vines planted today are of white grape varities such as Baboso Blanco and Vijariego, though some good reds are produced. They are often planted in steep slopes, up to 700 metres high. The main producing areas are El Pinar, Echedo and Valle del Golfo. As a gastronome and sommelier, I often try to find wines that match well the food I am having. Of course, there is not a written and strict code for pairing food and wine. Yes, we are all different and with different preferences. Overall, however, we can say that dishes can be paired well by concordance (foods and wines with similar aroma charcteristics, like spiceness such that found in Lebanese red wines with Lebanese spicy foods) or opposition (foods and wines that are quite different and thus balance each other out, such a sweet Port wine with a salty blue cheese like Stilton). One rule of thumb which I often tell my friends who ask me advice is that a LOCAL food and wine pairing is a good starting point. If we think that the concept that "eating local" is sustainable, clean and fair, then "eating and drinking local" is even more so. Furthermore, while travelling it makes even more sense. For example, while I was eating in restaurants in El Hierro, I was served local and fresh food, such as seafood and goat cheese.It made perfect sense to drink some local wines with it, and in the island I found three wineries that are worth mentioning: Tanajara, Bodega Frontera and Uwe. Tanajara, despite having had a rather good feedback from an international wine competition, is unfortunately closed down as I am writing, though one can still find their wines in the local supermarkets. For the price average of El Hierro wines which is around 7 euros on the shelves, these wines are more expensive (around 15 euros for the 2010 tinto) but of premium quality. The Bodega Frontera is a cooperative that makes wines with an excellent quality-price. 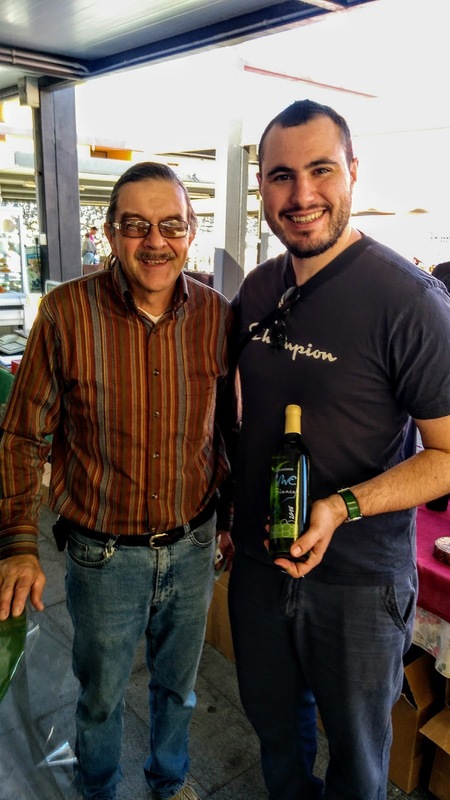 I have met Rafael, the winemaker, last year and he told me that recently they have exported some wine to the USA, as well. Uwe is a small winery managed by a German guy from Baveria. I have met him today at the local market in the town of Frontera. He told me that is making use of indigenous grapes mostly, like the red Negramoll. Uwe also told me about the local tradition of making the so-called "Vino de Pata", an artisanal wine made by a mix of red and white grapes (or in some cases, like in Uwe's 2010 Vino de Pata, just white grapes) pressed by feet. The 2010 I tried from Uwe was sherry-style, dry, with almonds notes and aromas of almonds and marzipan, clear signs of oxidiation. I found the "Vino de Pata" also in a bar in EL Pinar called Chachi, which offered it at room temperatures along with tapas. 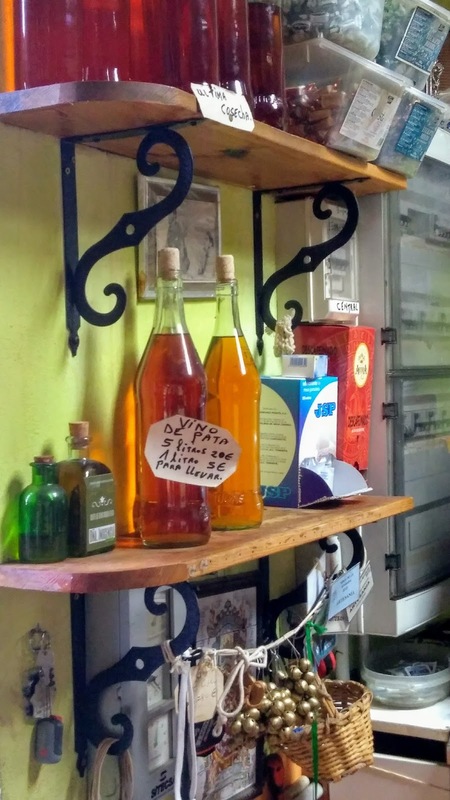 Here in El Hierro this wine is considered the drink for everyday and is very food-friendly. When aged, it can give rise to some interesting tertiary aromas. When young, it is easy drinking and fruity. 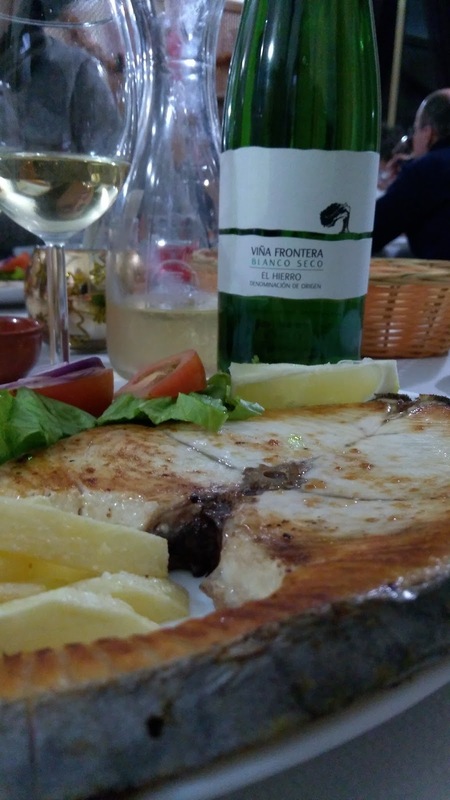 In the restaurants of of El Hierro, one mostly finds the wines from bodega Frontera and some are excellent for food pairing. I have tried the Blanco Seco which features citrus and tangerine notes along with a pleasant minerality and long lenght. I paired it with the the local "Pez Peto", the wahoo fish, and it was a great pairing. This volcanic wine gave a feeling of saltiness which paired by concordance with the salty fish. The wine also reminded of a white which I tried from the Greek island of Santorini, which is also volcanic. 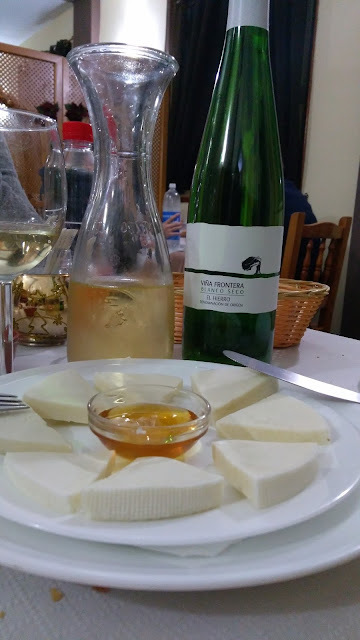 Another pairing that I have enjoyed was the Frontera Blanco Seco with a local and fresh goat cheese from San Andres, which has a quite delicate flavour, perfect with a white and fresh white. Instead, the same cheese but smoked (ahumado, as they say here) paired well by concordance with the red Tinto from Bodega Frontera. Indeed, the smokiness of the cheese was great when matched with the peppery and spicy notes of the wine. Also, it was very good with the fatty Jamon which had salty and meaty flavours, balanced out by the minerality of the wine. In short, while in El Hierro, doing just like locals is a good idea when it comes to food and wine paring. Having local food and wines proved to be one of the best experiences I had in this tiny island, which has a lot to offer from an eno-gastronomic point of view. 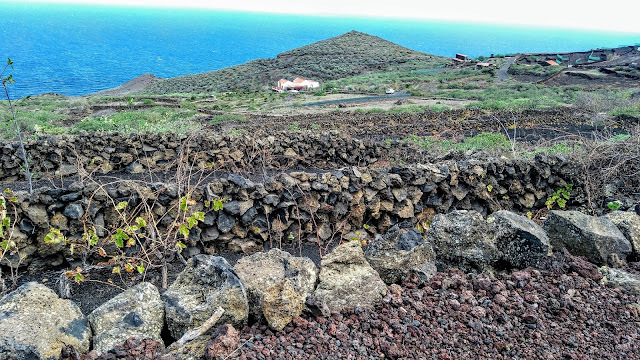 Given the limited wine production, one has to travel to El Hierro to enjoy these volcanic wines, preferably along with some local cheese, jamon and fish. El Hierro is a slow island, the capital of tranquility, and it is the ideal place for fully enjoying food and wine pairing, the local way.